The film tells the epic story of the Great Lakes by following the cascade of its water from northern Lake Superior to the Atlantic Ocean, through the lives of some of the 35 million people who rely on the lake for survival. 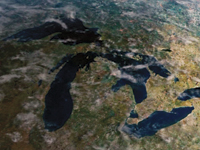 Providing earth with 20% of its surface fresh water and its third largest industrial economy, the Great Lakes are a unique and precious resource under assault by toxins, sewage, invasive species, evaporating water and profound apathy. They are also one of the planet's great preserves of extraordinary wilderness beauty and a bounty of unique species. WATERLIFE blends these realities with a dreamlike fluidity as it pours through the lives of some amazing characters. We meet an Anishinabe medicine woman who walked 16,000 miles around the lakes to sympathize with them; the last of the great Michigan fishing families; a man whose lakefront home now borders a field thanks to sewer overflows; the people of a village where mysterious toxins ensure that most new babies are girls; and the residents of Love Canal, a notorious Niagara Falls neighborhood abandoned in the 1970s and now dubiously refurbished. Along the way, WATERLIFE show viewers the Great Lakes as they might appear to a seagull, a fish or a water molecule...and from a myriad of other amazing perspectives. Filmed over a full year with a battery of specialty cameras and techniques, WATERLIFE provides an unprecedented view of an incredible ecosystem rarely seen by the city dwellers who form most of its population. From the ornate fountains of Chicago to the sewers of Windsor, viewers are carried through marsh and pipe, across pounding waves and through thunder clouds on a journey which, as the film says, has no "ending or beginning, that shapes every body it passes through and unites them all across space and time." WATERLIFE's director, Kevin McMahon, is one of Canada's most innovative documentary filmmakers. Gord Downie, leader of The Tragically Hip and a Lake Ontario Waterkeeper, narrates the film. Topping off this epic cinematic poem is a fabulous soundtrack featuring Sam Roberts, The Allman Brothers, Dropkick Murphys, Sufjan Stevens, Sigur Rós, Robbie Robertson, Daniel Lanois, Phillip Glass, Brian Eno and a new song by The Tragically Hip. Plus check out the award-winning interactive website. "A visually stunning, spectacular, and eye-opening film...I've spent many years working to protect the Great Lakes from pollution, degradation, and harm. But the film opened my eyes to these issues in new ways, thanks to its amazing documentary cinematography...Substantively, the film's coverage of the environmental problems and challenges that confront the Great Lakes is superb. Waterlife educates viewers without overwhelming or boring them - no easy task when dealing with complex environmental issues. It covers the hot issues in today's headlines, like the Asian carp swimming up through the Chicago River. And it also digs deeper, showing the fundamental challenge of managing a massive water system that is shared by two countries, ten states and provinces, and thousands of local communities." "Marvelous work...A brilliant documentary that is must-viewing for anyone who cares about water and our future, and that should be all of us...Waterlife will cause you to reflect, make you angry, and I hope, prompt you to talk about it. Tell friends, colleagues, and local leaders- because the film and its story need to be on everyone's radar. Then let it inspire you to engage and take action." "Visually and aurally beautiful, elegiac storytelling about the fate of the Great Lakes. No one who watches Waterlife can fail to care more about the Great Lakes and the people who depend on them. No one who watches Waterlife can fail to be stirred to take action to protect them. Waterlife shuns the cloak of rhetoric and pierces directly to the heart of the debate over the Great Lakes. Can we take the actions needed to pass this freshwater treasure on to future generations? Will we love them enough to try? After watching Waterlife I was inspired to think we can. I admire not only the skill of the team that created Waterlife, but also their expansive vision of the past and future of the Great Lakes. This may be the most important documentary ever made about the Lakes." "An excellent example of documentary film construction...This film is a moving piece of art. It is highly informative, taking a broad and multidisciplinary approach to presenting the environment, ecology, pollution, conservation, geography, and history of the Great Lakes. The information is intelligent as well, having depth and detail but avoiding becoming mired in specialist overstatements. This approach makes the film excellent for educational purposes. I would strongly recommend the film for inclusion in courses focusing on environmental science, issues of pollution, conservation, hydrology, and ecology." "Sobering...A vividly eye-opening account of serious environmental issues. Highly recommended, especially for high school classroom and public library collections." "A visually spectacular and highly thought-provoking film...A cohesive, richly textured accounting of the many environmental problems affecting the lakes, and also the challenges faced by the thirty-five million people who live near them in both Canada and the United States...Albeit the message of Waterlife is a dire one, it is not presented in a heavy-handed manner. The makers of the film weave together with concise narration subtly powerful interviews, stunning cinematography, and a smart soundtrack to appropriately say what needs to be said. The reviewer highly recommends this title for academic, public, and school library collections." "Beautifully shot...This film is both a celebration of the Great Lakes and a warning of increasing environmental dangers." "Waterlife is a great achievement: a comprehensive overview of the key ecological challenges facing the lakes that is at the same time aurally and visually magnificent. For historians unfamiliar with the range of issues that intersect here, in this massive watershed at the heart of the continent, this is an excellent place to start...Will doubtless be the Great Lakes documentary of choice for educators...The film would make an excellent addition to undergraduate courses in North American environmental history, global history, or more focused courses on the Great Lakes region." "One of the most stunning films about the environmental crisis I've ever seen...not only does it contain important information presented in a way that we haven't seen before but it is a beautiful cinematic experience." "A detailed, wondrous, educational film about the Great Lakes...Waterlife has a lot to say about the importance of the fresh water supplied by the Great Lakes, but the film doesn't neglect to show the extraordinary beauty of these bodies of water....McMahon manages to make his point -- that the lakes are threatened and that we all have a stake in preventing any further decline -- without preaching. In fact, Waterlife is as entertaining as it is educational." "Waterlife is a dire warning in the vessel of a tone poem, simultaneously a lyrical paean to the lakes' lingering beauty and a relentless documentation of their rising toxicity." "As spoken by scientists, fishermen, residents and narrator Gord Downie, the film's revelations are plenty disturbing. Yet with its gorgeous imagery and ethereal soundtrack, Waterlife also emphasizes the beauty of what's at risk." "There are a lot of environmentally themed documentaries floating around out there, but rarely do they present themselves on such a cinematically engaging level as Kevin McMahon's Waterlife. McMahon manages to balance his information with engaging storytelling... Overall, Waterlife was probably the best experience I had at this year's Hot Docs festival."